Remember when gas was only 18 cents/gallon? 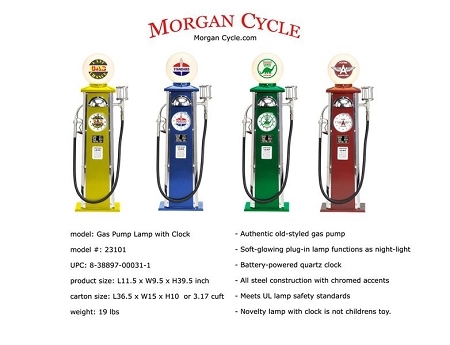 Maybe not, but our old-time gas pump with working clock and light makes a great decorative piece. Not too big, not too small - just the right size for your home, office, or workshop. Note: product is not children's toy. No choking hazards present, but contains glass parts. Light plugs into standard household receptacle. Extremely well made. Steel and glass, not plastic. Dimensions: Length 11.5" Width 9.5" Height 39.5"